It all started with one course offering — Introduction to Neuroscience — in 2001. Then, due to that class’ popularity, more and various courses were presented, and a neuroscience minor was born in 2004. Now, after 19 years to “grow up,” a full-fledged neuroscience major will be offered at Hope College starting with the 2019-20 academic year. 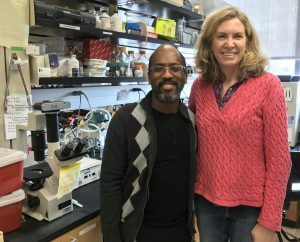 The growth of those neuroscience offerings, along with student interest, are due in no small part to the work of the program’s first parent, founding director Dr. Leah Chase, and now its adoptive and new leader, Dr. Gerald Griffin. The way one neuroscience class resulted in an eventual major is not surprising, given Hope’s solid scientific reputation, yet adding a new major program was not initially the plan, Chase says. The plan was to offer that one class to employ Chase’s teaching know-how (she’s an associate professor of both biology and chemistry) and research specialty (on neurotransmitter systems) while satisfying expressed interest that Hope students were voicing. Student interest remained strong, and with the 2015 faculty additions of Griffin, associate professor of biology and psychology, and Dr. Andrew Gall, assistant professor of psychology, a new major in neuroscience made every sense to add to the list of Hope’s 80-plus majors, minors and pre-professional programs. Neuroscience — the study of the brain and nervous system to better understand human behavior — naturally blends the academic worlds of biology, chemistry and psychology. At Hope though, it’s more than that. Students who major in neuroscience also must select from a list of classes in engineering, computer science, physics, mathematics and philosophy for a total of 63 to 67 credits. With such a breadth of requirements across several disciplines, the neuroscience major leans heavily into Hope’s liberal arts tradition. Neuroscience naturally blends the academic worlds of biology, chemistry and psychology. At Hope though, it’s more than that. Of course, research opportunities — another Hope trademark — will begin as early as students’ Introduction to Neuroscience course and continue through advanced neuroscience core courses as well. In the neuroscience capstone course, senior students will write an original grant proposal, conduct an original research study, and write a complete journal-style research manuscript. While more than 50 students are enrolled in neuroscience introduction classes each semester, about 30 are currently either neuroscience composite majors or minors. With the addition of an official major now, Griffin sees more growth on the horizon, and he’s ready for making his leadership priorities ones of community- and future-building.